Queen Of the United States of America? The British Monarchy wields more power today than we are led to believe. The United States of America claimed "independence" in 1776. Amazingly, defying all odds, all 43 Presidents of the United States are related!!! Thirty-Three of them alone go back to Charlemagne, one of the most famous monarchs of what we call France. 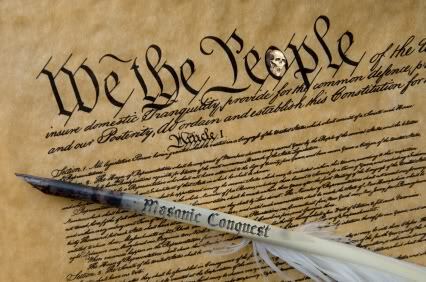 Freemasonic historian Manly P Hall documents that out of the 56 signatories on America’s declaration of independence over 50 were known freemasons. And all 56 who signed the declaration were cousins, and of a royal bloodline. "All bills of credit omitted, monies borrowed and debts contracted by, or under the authority of congress before the assembling of the US in pursuance of the present confederation, shall be deemed and considered a charge against the US for payment and satisfaction where of the US and the public faith are hear by solemnly pledged." These loans were owed to the British crown. Therefore by loaning the money Britain knowingly funded both sides in the American War of Independence. The funding of both sides of a war is another familiar method used by the illuminati. The Virginia Company was the corporation headed by the British crown that controlled the 'former colonies' before the manufactured war of independence. The main stock holder when the original charter was completed on 10/04/1606 was King James I. - The lands of the Virginia company were granted to the colonies under a deed of trust (on lease) and there for Americans cannot claim ownership of the land. This was retained by the British crown. - The colonial lands were to be governed by two colonial councils, each with 13 members (remember I mentioned 13 families? ), but the Kings council in London had the final say on all decisions. - The sitting British monarch can choose the Governor of the American Colonies, ie the President. - The monarch insisted the Christian religion be imposed on all the people, destroying the native culture. - The criminal courts on the lands of the Virginia Company were to be operated under Admiralty Law*, the Law of the Sea, and civil courts under common Law, the law of the land. 3. On any lands reserved or acquired for the use of the US, and under exclusive or concurrent jurisdiction thereof, or any place purchased or otherwise acquired by the US by consent of the legislature of the state. The United States of America, The USA or The US. This means the Unites States of America is not a country, it is a corporation and it is owned by the British crown. To this day, Britain collects taxes from the US via the IRS, the IRS is not even an agency of the federal government, check publication no 6209. The IRS is an agency of the International Monetary Fund (IMF), the IMF is an agency of the United Nations. The law was never even passed to introduce the charging of personal income tax, seriously, search for evidence to disprove that statement, you won't find any, just heaps of evidence which proves its another scam! On the uniforms of US troops, in federal buildings, in criminal courts and even when the president is giving a statement, the US national flag is always displayed with a gold fringe. The gold fringe indicates it operates under the jurisdiction of commercial law, known also as British maritime law and the uniform commercial code (UCC). To think that the US Government and the legal system works within the American Constitution set up by the founding fathers is wrong. Just like the monetary system, its all corrupt and unconstitutional.